The fading photograph to the left is one of my most prized possessions. It captures my mother smilingly reading aloud to me, aged 2, and my joyous response to the story. The book is a Little Golden Book (remember those) perhaps my favorite, The Poky Little Puppy. 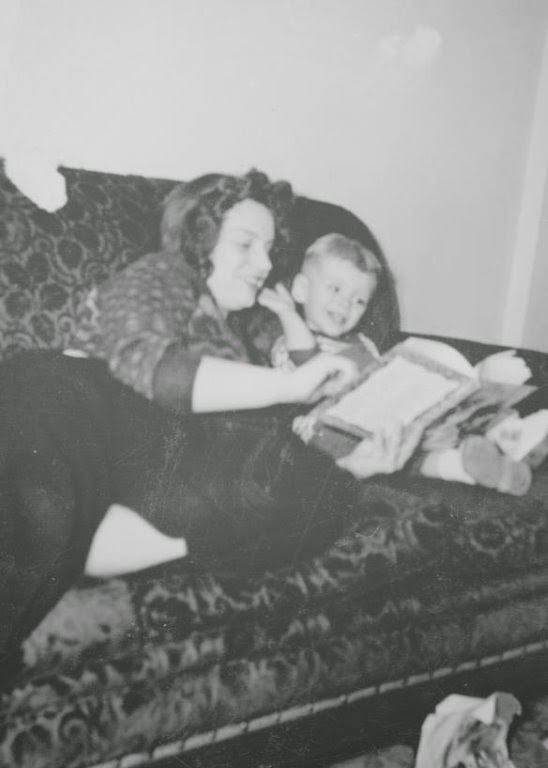 I don't remember this particular reading time, but I do remember that huge, dark red, fuzzy, old sofa so comfortable to stretch out on, and of course, I remember the warm, cozy feeling of having my mother read to me. My mom is just 21 years-old in this picture, already with one child and with my brother on the way. She had left school in 10th grade, in the middle of World War II, to work as a telephone operator and married my dad at age 17. Somehow though, she knew how to raise a reader. She knew that reading aloud to her child was a critical part of bringing the precious gift of literacy to her child. A few years later, when I entered school and was beginning to read on my own, my mother gave me a second great literacy gift. Digging deep into a very tight household budget, she enrolled me in the Weekly Reader Book of the Month Club. I can clearly remember the first book that was delivered to our house. It came in brown paper and, magically, the mailing label read "To: Master Russell Walsh." It is the first parcel I ever received in the mail. It had my name on it. The book was mine. Under the brown paper was The Living Desert, a book based on a Disney documentary on desert plant and animal life. The book was likely nothing special, but it was mine, all alone, and I treasured it. I took it to my room, and though it was probably above my reading level, I worked my way through it page after page. I groaned when mom called me for dinner and only my father's intervention got me to put the book down long enough to come to the table. As soon as I could, I excused myself and went right back to reading. I finished it, with a flashlight under the covers, late that night. I took it to school for "show and tell" the next day. Over the months and years the books kept coming and I eagerly anticipated my brown paper parcels. I remember titles like Old Bones and Wild Geese Flying and No Children, No Pets and Mystery in Old Quebec. My progression as a reader was not linear. There were some fallow years where a preoccupation with sports and later, girls, intervened. There were several years where my recreational reading was limited to the backs of baseball cards (loved those statistics) and a little book that I read with eyes wide entitled What Every Boy Should Know. Sometime during ninth grade I discovered the short novella The Pearl by John Steinbeck and I was off and reading again. With fits and starts, I have been a dedicated reader of books, magazines, newspapers and now, blogs ever since. I cannot imagine my world without reading. I cannot imagine living a life without reading. My mother brought this gift to me. When I was small she read to me. When I was a little bigger, she made sure I felt what it meant to have ownership of books. She supported me in all my academic endeavors, even if she occasionally thought I was getting "too big for my own britches." My mom knew how to create a lifelong reader and while it seems inadequate, I really need to say, "Thanks, Mom."